two new additions of wines to the AF Wine Company’s portfolio. The Hillside range consists of two white wines and four reds, where the Select range has one white, a Rosé and three red wines. Both ranges have been specifically developed for the Export and Trade markets, and therefore fit into this most competitive area of the marketplace. The Select range has recently been introduced onto the local domestic scene and is proving to be most popular. 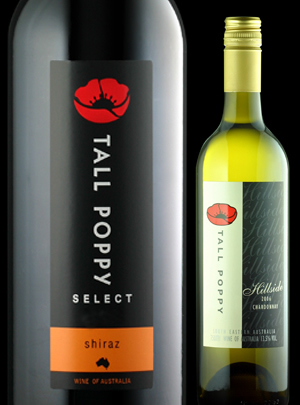 Using similar winemaking techniques, and attention to detail, the Tall Poppy Hillside and Tall Poppy Select ranges provide a good quality and affordable alternative to our premium Tall Poppy range.